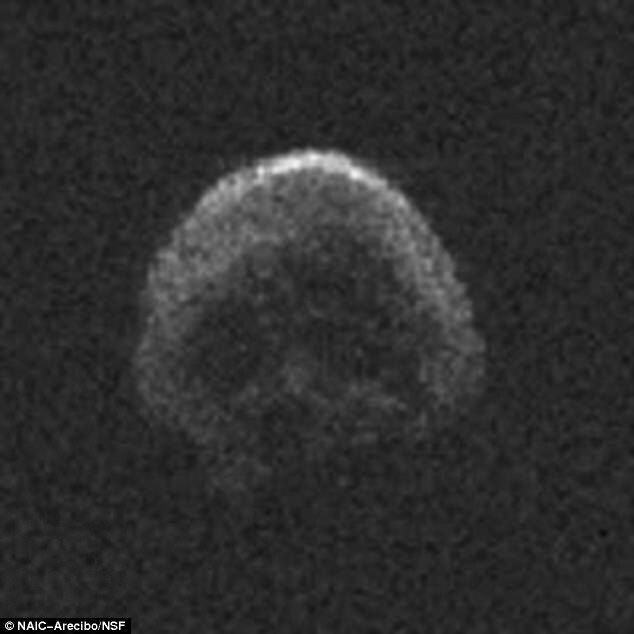 Earth is set for another spooky encounter with a 700 metre asteroid that looks uncannily like a skull. 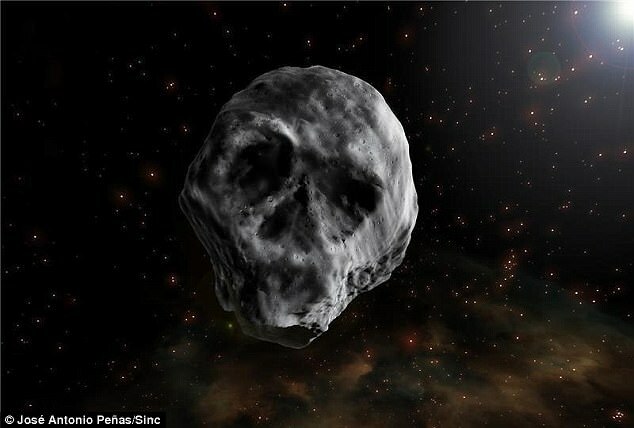 The space rock first passed 'close' to our planet at 78,000mph (125,500km/h) at a distance of 310,000 miles (499,000km) on October 31, 2015, just in time for Halloween. This is a really creepy asteroid. Now, it's set to make a return in November 2018, giving scientists another opportunity to study the strange phenomenon. Experts studying the 2015 flyby of the object recently published a paper detailing their observations, which they hope to add to when it makes its comeback. Scientists used observatories around the world, including from Hawaii using the Pan-STARRS telescope, to make their findings. The rock, known as 2015 TB145, will flyby at a less dramatic distance than the last one. The asteroid will zoom past the planet at about 105 Earth-moon distances, compared to just under 1.3 lunar distances last time around. Astronomers analysing the 2015 readings found that the asteroid likely completes one rotation every 2.94 hours. The object measures between 625 and 700 metres (2,000 to 2,300 feet), its shape is a slightly flattened ellipsoid, and its rotation axis was roughly perpendicular to the Earth at the time of its closest proximity. The amount of heat which it retains and the speed at which it absorbs or transfers heat is consistent with that of similar sized asteroids. The reflectivity or albedo of the surface of this asteroid is around five or six per cent. In a written statement, researcher Pablo Santos-Sanz, from the Institute of Astrophysics of Andalusia, said: 'This means that it is very dark, only slightly more reflective than charcoal. The full finding were published in the journal Astronomy & Astrophysics. Back in 2015, the comet's approach led to claims from conspiracy theorists that it could cause earthquakes and tsunamis. One Reddit user said: 'I assume it would wipe out any city it happened to hit. If it were to hit, there is a 71 per cent chance it will hit water. 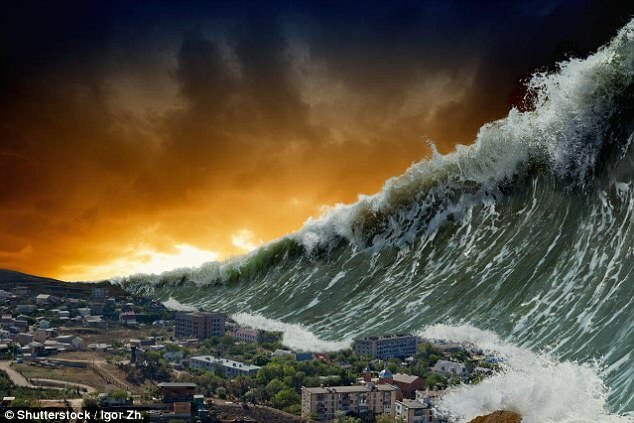 A tsunami would be the biggest concern. Another added that it could mean 'very bad things'. Scientists also think that the asteroid could in fact be an extinct comet which lost its volatile compounds after orbiting the Sun numerous times. In general, asteroids and comets are mainly distinguished by their composition, the former being more rocky and metallic, while the latter have a higher proportion of ice and rock. Their type of orbit around the Sun also differs, but at times it is not easy to tell them apart and rhe boundaries between them are becoming increasingly diffuse. Both were formed during the first stages of our solar system, which was born around 4.6 billion years ago. Asteroid 2015 TB145 was discovered on October 10, 2015, by the University of Hawaii's Pan-STARRS-1 (Panoramic Survey Telescope and Rapid Response System) on Haleakala, Maui, part of the NASA-funded Near-Earth Object Observations (NEOO) Program. Because of its erratic orbit, Nasa isn't sure where it will go, but the space agency says it's confident it will not hit Earth.